Waffles hates getting his teeth brushed! We’ve received advice from many dog owners that we should start early to get him used to it. We started brushing Waffles’ teeth when he was around 9 months old, but this was not early enough. Here are a few reasons why we didn’t start earlier, and what we learned from this. We gave him Greenies and hoped it would do the trick. This is totally the lazy shortcut. 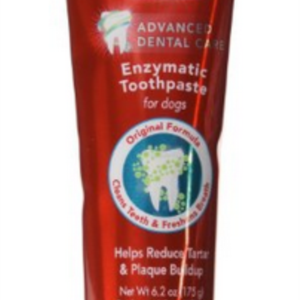 How can Greenies possibly get rid of the plague build up on a dog’s teeth? I think Greenies help, but this is definitely not a long term solution for healthy teeth. Greenies should be supplemental and should not replace the actual notion of teeth brushing. I don’t know how healthy these snacks are and I got paranoid after reading horrible reviews about dogs puking green foam after eating Greenies. Waffles used to bite A LOT. Even if we tried to pet him, he would try to bite our fingers. We were definitely afraid that our fingers would be seen as gnawing toys and we just didn’t want to risk getting too close to his mouth. Unfortunately at 10 months, I can see the plaque buildup on his back teeth. I know if this isn’t addressed soon, his teeth can rot and eventually fall out. Not only that, he’ll probably have bad breath from the decay. I’ve seen other dogs that do not have good dental hygiene, and I don’t want this to happen to my dog, especially if I can prevent it now. So, I bought some toothpaste online and used a human toothbrush with soft bristles. It didn’t really work out at all. My husband had to hug him tightly while I tried to get the toothbrush into Waffles’ mouth. On my first pass at this, Waffles licked all the toothpaste. I can conclude that he likes the toothpaste but a big no on the teeth brushing! I thought it might be easier if I got one of those finger brushes but it was even harder! I couldn’t even get the brush into his mouth. It’s easy to get the front teeth but the back ones are much more difficult. Finally, I purchased a dog toothbrush. These are angled human toothbrushes. I’ve concluded that the dog toothbrush is the “easiest” of the 3 options. I would recommend spending the extra $3-4 for a dog toothbrush for the care and well-being of our little guy.